I have been re-reading Brene Brown's The Gifts of Imperfection lately. In case you didn't know, I'm a HUGE Brene Brown fan. In fact, I've met her in person! 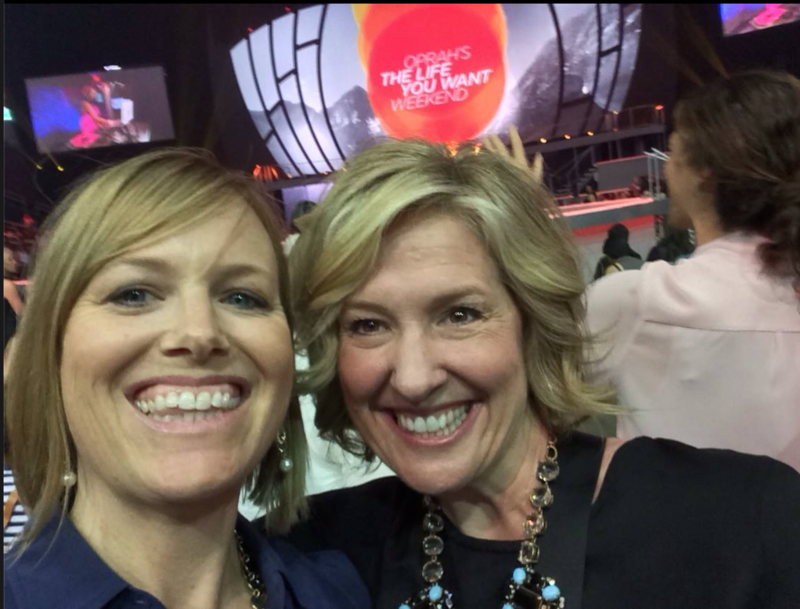 I was super giddy to get a selfie with her last September at Oprah's The Life You Want Tour. If you're not familiar with her, she's an author, researcher and speaker on vulnerability, worthiness and shame. The Gifts of Imperfection discusses how it's sometimes difficult to define who we are and what we do in an honest way. And when we can't define what we do, it gets in the way of creating meaningful work. When people ask Brene what she does, she says, "I'm a mom, partner, researcher, writer, storyteller, sister, friend daughter, and teacher. All of these things make up who I am, so I never know how to answer that question. And, to be honest with you, I'm tired of choosing to make it easier on the person who asked." WOW. I can totally relate! Can you? And it made me think about how us solopreneurs wear just as many hats. Most of us are not only the CEO, but are also the salesperson, the bookkeeper, the HR rep, the IT girl, the customer service professional, and the marketer. No wonder they say being an entrepreneur takes courage and stamina! And, most of us are go-getters - we WANT to do it all. We're so passionate about our mission that we are gung-ho and ready to do what it takes to make it. But a Jane-of-all-trades makes us an expert in none. And it limits the joy we bring to our business. Or maybe we have an inner control freak that won't let go. Let's face it - we probably HATE at least one of these hats. Yet we feel like we SHOULD be better at it, so we purchase products and programs to help us do this thing better. And we still don't like it! How would it feel to let go of some of those roles so that we can truly focus on what we LOVE about our business? How much MORE meaningful could our work be if we could shed some of these "supposed-to's", such as marketing? That's exactly what clients have been coming to me for lately. Marketing is definitely a strength of mine and I get fired up when I coach women on their message and marketing strategy. Yet some of these powerful, visionary women want more. They want a right-hand wing woman - someone whom they can trust to take their genius and market it in a creative, grounded and elegant way. And I'm honored to be supporting them! I love helping visionaries leverage and deepen their message - and take that marketing hat off their head so they can be free up their time and energy to STAY the CEO, the visionary and to keep the soul of their business. Want to know how I'm helping them? And it's a freakin' blast! These women are breathing a sigh of relief as they see mega-marketing to-do list lighten. They are doing a happy dance as they see their engagement rise. And they are giddy when they see ready-to-use, sounds-like-them marketing copy come to their inbox. If you have been thinking that you are ready to unload some of your Jane-of-all-trades hats, such as strategic marketing + implementation, then let's talk!